An inmate still being detained in Guantanamo is set to have his diary released to the public Tuesday following a 6-year struggle with US authorities to declassify the document. In 2002, Mohamedou Ould Slahi was transported to Guantanamo aboard a US rendition flight on suspicion of attempting to carry out a terrorist attack on US territory in 1999. Slahi, 44, said he confessed to participating in a number of terrorist activities after enduring repeated torture by his American captors. And selling is exactly what he intends to do. Slahi’s book, ‘Guantanamo Diary,’ which describes in highly redacted yet dramatic style his incredible ordeal from the moment his plane landed in Cuba is scheduled to hit bookstores next week. Slahi will not be making any public book signings of his diary, however, since he remains incarcerated at Guantanamo. The Mauritanian allegedly joined al-Qaeda in the 1990s with the purpose of helping to fight against Afghanistan’s Soviet-backed government. Slahi says he left the group in 1992. Following the 9/11 attacks, he was arrested by US authorities on suspicion of being involved in a failed attempt to bomb Los Angeles International Airport in 1999. He was transported aboard a rendition flight to the US military base in a desolate corner of Cuba in 2002 following interrogation in Mauritania, Jordan and Afghanistan. In extracts from the book, which have been released by the Guardian, Slahi describes the journey to Cuba aboard an aircraft, where he was bound and hooded. But Slahi’s nightmare ordeal was just beginning. 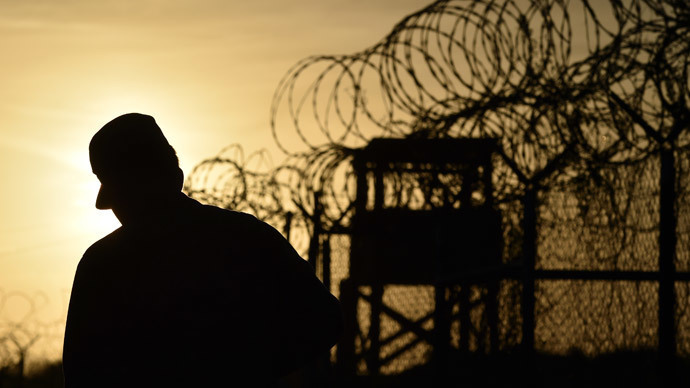 Once at Guantanamo, he was forced into solitary confinement where he says he “was on the edge of losing his mind.” The diary describes how Slahi was subjected to sleep deprivation, death threats, sexual humiliation and intimations, The Guardian reports. Slahi’s attorney, Nancy Hollander, said her client had never been charged with any crime.